The struggling retailer seems to be following the same failed path handbag maker Coach has pursued. Macy's is downsizing its footprint next year, signaling that the retailer may not be done falling yet. Macy's (NYSE:M) says it's going to close as many as 40 stores by early next year, a move my Foolish colleague Sean O'Reilly suggests is "brilliant," but that I see as a warning sign of more troubles to come. While the closures are predicated on it expanding an "omnichannel approach to customers," the retailer also admits the three dozen or so stores are poor performers, and it's always taking those on the lowest rungs out of commission while opening new ones to replace them. Except -- over the past five years, Macy's has closed just 52 stores and opened 12 new ones, meaning the latest round of shutterings will, in one fell swoop, represent three quarters of all the stores it's closed in the past half decade. That's a lot of underperformance right there, but we've seen the evidence of it building up in its disappointing earnings reports. The department store operator said sales fell 2.7% in the second quarter to $6.1 billion, a big miss on Wall Street's consensus estimates of $6.24 billion, while per-share profits of $0.64 were an equally large whiff on forecasts of $0.75 per share. It was also much worse than the $0.80 per share earnings Macy's recorded a year earlier. Most telling, perhaps, was yet another quarter of declining comparable-store sales, which fell 1.5% on an owned and licensed basis, and is a steeper decline than what was witnessed in the first quarter, when comps came in just 0.1% lower. But since the beginning of 2014, Macy's has only notched two quarters of same-store sales growth, and one of them was the bustling fourth quarter that included the Christmas holidays. By itself, Macy's move toward a more "asset-light" business model that emphasizes its e-commerce offerings over its bricks-and-mortar stores seems smart, but when you take into account the other moves the retailer has made in recent weeks, you can see growing indications of trouble -- and desperation. 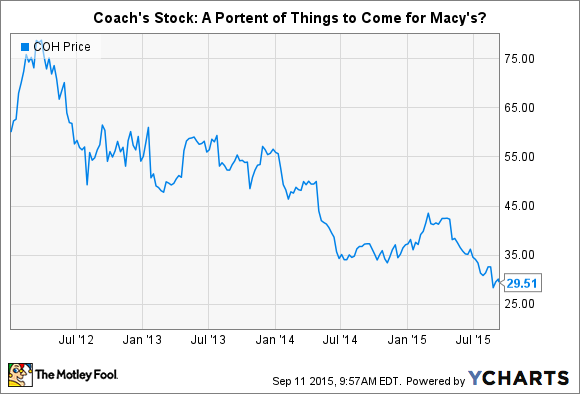 Closing down full-price stores while pursuing opposing price point extremes, could set Macy's up for the same kind of failures that have plagued Coach as it followed that course. Source: Nicholas Eckhart. Strategic retreat, or full-scale rout? It looks like Macy's is following the playbook laid out by handbag maker Coach (NYSE:TPR) when its own sales began to falter, but they were ultimately moves that only hastened its decline. Coach's stock has now lost almost two thirds of its value since 2012, when its troubles began, and the stock is down 20% so far this year. As competition from Michael Kors and Kate Spade began to chip away at sales, Coach began increasing the number of off-price outlet stores it opened, going from 121 stores to 207 in just four years, while at the same time boosting the percentage of sales higher-priced handbags represented to total sales, with the $400 price point accounting for more than 30% of its handbag sales compared to just 18% two years ago. In short, it tried to play both extreme ends of the handbag market while ceding the middle to the competition. That's what Macy's is doing. It said it would transition 150 of its 855 stores to a more high-end experience, with the top 20% of stores, its so-called "platinum doors," not having any clearance merchandise at all on its racks. At the same time, it also announced it would go after the financially challenged consumer by opening new T.J. Maxx-style off-price discount stores called Macy's Backstage. It plans to have six open by year-end, with many more coming next year. Just as Coach left the mid-tier market to Kors and Spade by closing dozens of its full-price stores, Macy's is giving up ground to rivals J.C. Penney and Kohl's. Both retailers have had their own worries, but while Kohl's continues to struggle, J.C. Penney is gaining traction on its turnaround and would seem best poised to capitalize on Macy's leaving the field. That can only speed up Macy's decline. Even now, Coach doesn't seem to have fully grasped the key to its recovery. While it has recorded net closures of outlet stores and dramatically reduced the number of discounts it offers, it remains committed to the higher price-point handbags and its evolution into a lifestyle brand. Its continued diminished financial position reflects those priorities. Macy's is similarly trying to be all things to all people, but the experience of Coach should serve as a warning that being a jack of all trades also means mastering none. The store closures aren't a flash of brilliance, but rather they represent just another example of a management team flailing about in a bid to stay relevant to consumers.